I used Modelio in a previous version before. Now I start using 3.3 (latest version). When exporting my class model to XMI I miss the trigger text in the transition. It was there in the previous version I used. I have a signal defined and the transition property dialog shows under "Sent signals/events" my signal. So I guess everything is as it should be. But maybe I missed something. I run under Mac OS X and use UML 2.4.1 for export. Any idea? Only the Transition from Idle to Cooking was done in the correct way. At least this trigger should be in the XMI file. no one any idea? Could it be a bug? Could you tell me what was the previous version you used? I do not see any Event Element in our model, I am right? >Could you tell me what was the previous version you used? >I do not see any Event Element in our model, I am right? Isn't that the correct model element to use? did I do something wrong? Can you make a statement about my issue? In fact iin UML, transition action are trigerred by Event. Modelio allows you to specify String (for layout purpose) or Event. 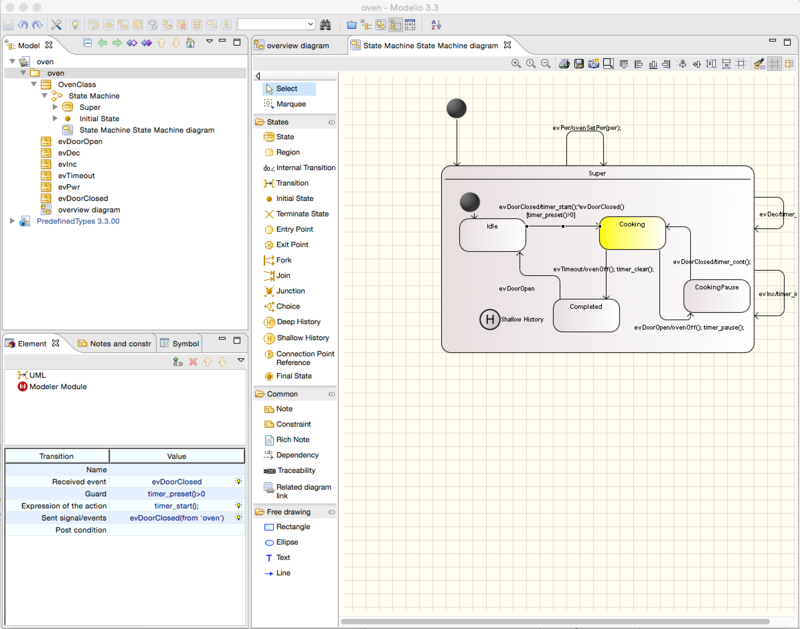 In your model, you used String and the xmi export behavior changed between Modelio 2.2.1 and Modelio 3.3. This difference will be solved in a future version but in the same time it would be better to use Events. 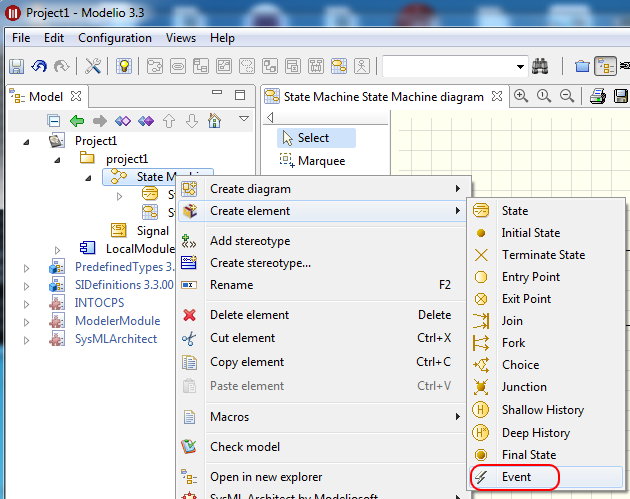 To create Events, right click on the StateMachine as depicted below. Then configure your event in order to made a reference to the appropriate Signal. And finally change your transition properties.